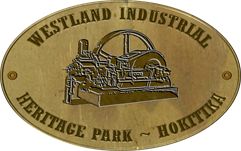 The Westland Industrial Heritage Park has been operating since 1999/2000 when it had around a dozen original members. The Park grew out of the original Westland Farm and Vintage Machinery Club that was formed in the 1980s. Following a fall in membership, this club was reformed as the Westland Industrial Heritage Park in 1999. The new park got off to a great start as the original club was financially healthy and also held a number of important pieces of machinery. Among the items in the collection was the Twin cylinder Ruston engine that was gifted to the original club in 1984. It sat at the Westroads Depot in Kaniere until 1999 before being transferred to the Park for eventual restoration and display. Council and with the addition of the Council’s (ex County) collection from the Westroads depot, the new Park was off to a healthy start. Since then the Park has blossomed with additional land being accessed and developed, new buildings created, equipment obtained and large donations of all sorts being made by the general public. Unfortunately the old workshop was razed to the ground by fire in 2012, with the loss of all the plant and stores as well as the partially restored 1944 Westland County Council Ford V8 truck. The fire was in many ways a blessing in disguise as the subsequent rebuild enabled us to completely refurbish a new workshop and outfit it with good quality tools and machinery. The “44” was completely rebuilt thanks to a wonderful effort by our Club Captain Neil Beecroft, with assistance from the late Neil Houston.